I grew up in rural Northern Idaho and Montana and my father would take me hunting as a child. I don't think I ever actually hit anything ( I was very young) but it did make a strong impression on me - the seriousness of the task and the quiet waiting in the forest for hours. There was a lot of wonder and also necessity in it; at that age it seems a bit surreal. The knit pieces just came together and made sense to me with these memories. Her explanation conjures up memories of my own family history: my grandfather was a hunter and his wife, my grandmother made clothing for the family. Her knit deer would have served as an ideal icon for my own family. Add to the list of accomplishments found in a single Denny piece: the ability to connect with it's audience on a profoundly personal and familial level. The first knit piece was intended to be a chromed deer head mount, referring to the carcasses seen on the side of the road, but it proved too expensive to make for me at the time. I played around with the imagery for awhile, looking for a suitable replacement and this juxtaposition came about. Quick! Let's make a list of all the amazing things happening in this room: #1 Blue Doe (obv.) #2 HORSE FIGURINE! & tied for second, Design Crisis Gift Guide approved, Carlos Night Light! The "Proper Lady" idea began its life as a quilt, but it seemed unfinished - a bit flat and I didn't like the texture on a bed. 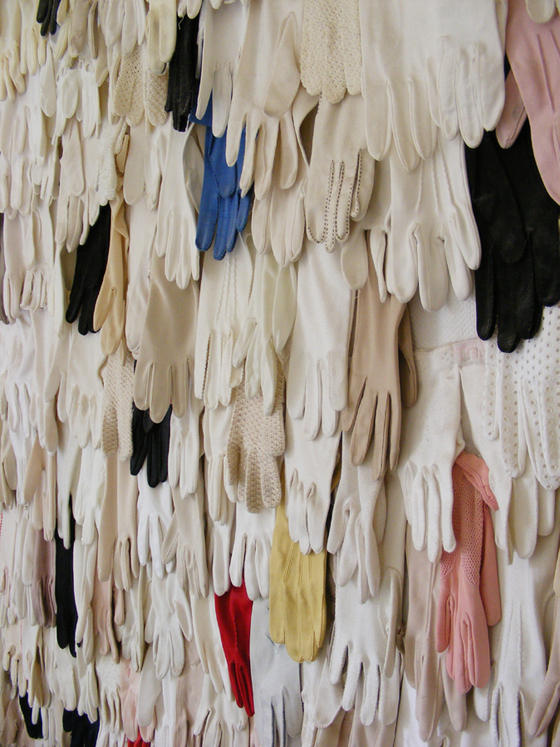 The piece took on even more meaning when demoted to the floor and I loved the contrast of these prim, ladies gloves as a rug. I like when a work can take on multiple meanings and I also like leaving that up to the viewer because they bring in their own experiences to work. I appreciate that, like the original chrome deer that evolved into a knit work, Rachel allows the works to speak to her, dictating their own outcome as she goes. I believe it is because of this that her pieces can exist on so many levels. She mentions that she was initially hesitant to let humor show through in her work. Noting "I wanted to be taken seriously, but I feel humor and beauty are often very successful ways to get someone to approach a new idea." I couldn't agree more. I also think it is the existence of humor in her work that adds the final finishing touch to each piece. When sifting through Rachel's portfolio I find the above piece, which appears to be laying the groundwork for her later works: early conceptions of the chrome deer head, and a shag rug that will later take its form in a landscape of lady's gloves. Most of the pieces from her current body show themselves in various stages of completion. Rachel mentioned that she is best when kept busy, but the appearance of at least 6 projects here makes my head spin. I am so enchanted with how snugly the wool fits each piece. Rachel uses found sweaters rather than knitting the pieces by hand - can you imagine how long that would take??!! - often felting the pieces before stretching them around the musculature of a deer (that she made herself, mind you).